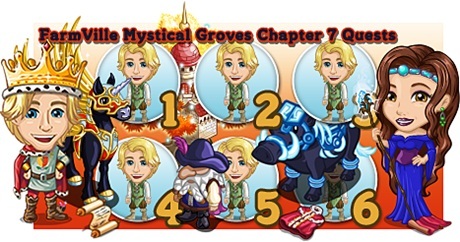 There will be a coronation event happening in FarmVille Prince Charming, a FarmVille Mystical Groves Chapter 7 Quests. after several obstruction and delay, Merrick will be finally receive his title. He wants to give Renara and Tattle a break whose been very supportive and he will need our help for the preparation of this event. On this chapter of Mystical Groves, there will be four crafting tasks. Two of the recipe will be done at the Apothecary while another two which are both level 2 recipe will be crafted at the Alchemist’s Shop. There’s also an animal mastery requirement and we will gonna need a Zoo pen for this so that we can harvest it faster. Note: Expected release date will be on Oct 28, Monday. Info: Crafted in a level 2 Alchemist’s Shop and it will need Fairy Blossom Bushel x2, Bright Stalk Bushel x3 and Goldenseal Bushel x2. Tip: Place and harvest the Riding Boar at the Zoo. Info: Crafted for 12 hours in the Apothecary and it will need Blue Bubble Brew x2 and Dream Draft x2. Info: Crafted for 6 hours at the Apothecary and it will need Herb Bundle x1. Info: Crafted in a level 2 Alchemist’s Shop and it will need Blakk Root Bushel x3, Burdock Bushel x2 and Dusk Turnip Bushel x2.